Stress and Cars and Stress! It is 5:00 P.M. I say this because I just got home and we left the house this morning at 8:00 A.M, We went to look at a used car which we ended up buying but I never dreamed we would have been gone ALL day. We saw the ad in a sale paper last night. 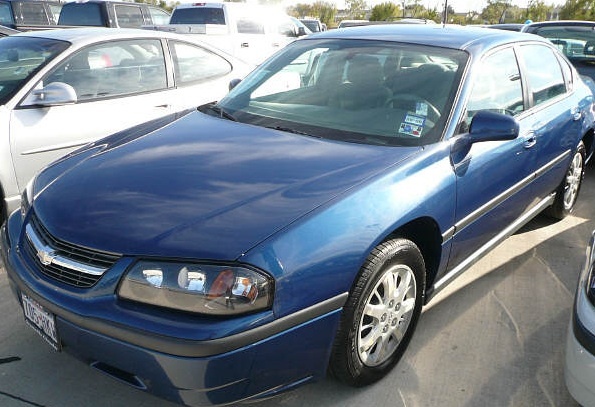 It’s a pretty 2005 blue Impala. We had been looking at cars knowing that when school starts we were going to need another vehicle. We were looking at something that would get good gas mileage for obvious reasons. I was leaning towards a Toyota Corolla or Nisson Sentra but Dale has always liked the Impala so he is happy. I just can’t believe how disorganized the whole experience was. The car was not even at Bonham Chrysler which is where the ad was from. They looked all over the lot and then started calling around and it ended up being in Greenville. The salesman got a car (a 2008 Dodge Magnum which is very nice, by the way) and drove us over to Greenville It was lunchtime by the time we got there. The car was there but the key was NOT! They hunted and couldn’t find it and decided to go up to the Pontiac place and get them to cut a new one. Keeping in mind this is only a little ways down the road, an hour later we finally have the keys. We drove the car and liked it and then had to drive back to Bonham. Next we had to do the whole paperwork thing which didn’t take too long but by the time it was all complete it was about 2:30 and we have still not had lunch. They were cleaning the inside and washing the car and by the time we left it was 4:00. We headed for the nearest restaurant because we were starving and then got to sit in traffic because a long stretch of 82 was being resurfaced. We are tired, cranky, and the proud owners of a “newer” car. If you know me you will know how much I hate to part with money for a car but now I just hope it turns out to be a good car and that it lasts half and long as my little blazer but with better gas mileage! This entry was posted in Personal on June 27, 2008 by Dee. Sweet car! Paula, Jackson, and I got stuck in the same traffic on 82. Great way to end a Friday afternoon!! You left out an important detail- where did you eat lunch in Bonham? They have a couple of really good places. Thanks Denise! I think the blue is sooo pretty. That traffic was horrible – I hate the smell of that tar/oil/whatever! BJ – I hope so too! Paula – the Dragon Seed which is not great but ok and especially when you are starving and I wanted veggies so I lucked out and filled up on fried zucchini!